With the prospect of 20mm of rain in the forecast for today and our lawn, like everyone else’s around here, still covered in three feet of snow, you can imagine there’s a concern about flooding. Yesterday I was standing in snowdrifts shovelling the white menace away from the foundation at the front of the house forgetting, of course, that under three feet of snow there’s three inches of ice from our own ice storm that floated through here just before Christmas. This is of particular concern at the bottom of the driveway where our downspout from the house, built into the landscaping when we had it done a couple of years ago, empties into the street. Chipping away at the ice floe around that was heaps of fun yesterday. And now as I gaze through the windows in my writing den out to said street I watch as a fiery pink sunrise bursts onto the horizon. “Red sky in the morning, sailor’s warning.” Hmmm … looks like we’re in for a doozy. Well, since one of the main topics of conversation around the world of late has been the crazy weather, why should we be any different. Ten centimetres of snow two days ago; 20mm of rain and a possible thunderstorm tonight. And then back into sub-zero temps for the weekend and into next week. Why not? So, I remind myself of warmer temps to come with this image culled from last summer’s archives. 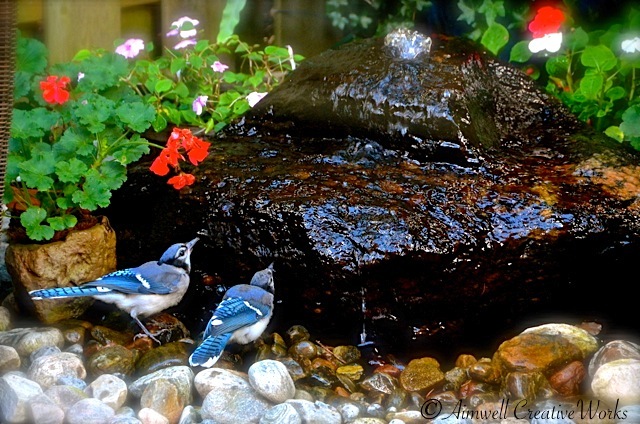 Two young bluejays pay a visit to our bubble rock ~ the local avian watering hole ~ for a refreshing drink. The bubble rock is presently buried under the snow. In a couple of months it’ll once again be the gathering place for thirsty birds and a quiet spot of meditation for me. This entry was posted in Animals, Canada, Flowers, Garden, Nature, Photography, Uncategorized, Writing and tagged Aimwell CreativeWorks, birds, bluejay, Dorothy Chiotti, flowers, gardens, Ontario, Photography, snow, summer, sunrise, water, Weather, winter. Bookmark the permalink. It’s a beautiful photo Dorothy 🙂 I really hope you don’t suffer the floods! It’s just been continual here. Let’s see, flashlight, floodgates, flippers. Yup, you’re all set.